Only started listening because of The Doughboys, now I'm hooked. Their passion for theme parks is contagious! I can honestly say that this is my favorite podcast. I have only been to some of the Orlando parks once and have never been to the California ones, but I just love their humor and deep dives off topic. I don't even like theme parks but these guys' passion and absurb devotion to them is awesome. Jason for Disneyland mayor! Jenny Nicholson returns! We talk Disney's CES/World's Fair mashup, Innoventions. Disappearing phones! Low energy marketing execs! Free to play Sega Games! Plus, which exhibit had the most ghoulish sponsor?<br><br>Head over to the Second Gate to hear Jenny talk Sonny Eclipse!<br><a href="http://patreon.com/podcasttheride">patreon.com/podcasttheride</a><br><br>THIS EPISODE SPONSORED BY HELLOFRESH<br><a href="https://www.hellofresh.com/themepark60">https://www.hellofresh.com/themepark60</a> ENTER "THEMEPARK60" FOR $60 OFF! What The Hell Is Going On In Anaheim? Join the Good Boys and Kyle Mooney (SNL, Brigsby Bear) on one of Star Tours' daily departures to the moon of Endor. We are assuming this trip will go off without a hitch. Stoney Sharp (Comedy Bang! Bang!) guides us on an thrilling journey to exotic locale: his childhood home of Central Florida. Also, we talk about the 20,000 Leagues Under The Sea ride. Join the boys, The Mariner, Helen and guest Jordan Morris (Jordan, Jesse, Go!, Bubble) for a splashtastic discussion of the classic Universal Studios water-based stunt show! The boys tackle Disneyland's "Great Moments with Mr. Lincoln," a ride most dads call "Great Moments with Air Conditioning." Bonjour mesdames et messieurs. Julia Prescott (Everything's Coming Up Simpson's, Townies) joins us as head into the heart of darkness: Disney Village, the weird mall outside of Disneyland Paris. You're not going to wannna miss a thing when the good boys of Podcast: the Ride talk about the bad boys from Boston and their rockin' ride. 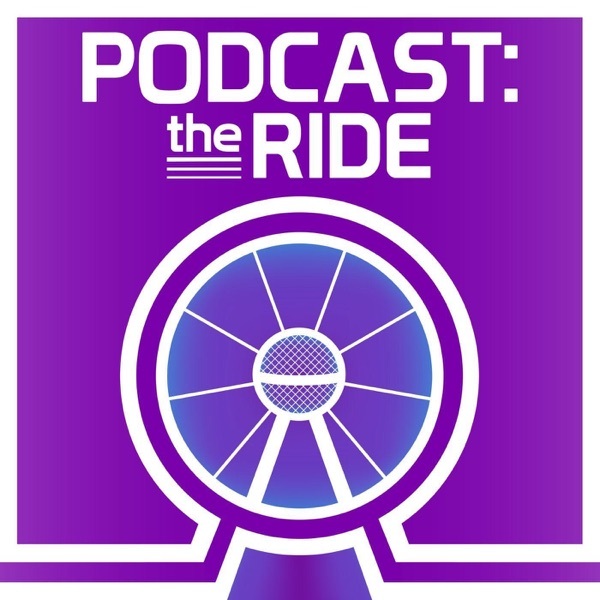 Podcast: The Ride digs into the best spot for air conditioning at Epcot, The American Adventure! A show that asks the question," Has America been too successful?" With Eva Anderson (Comedy Bang Bang, You're the Worst). Tuck your pants into your socks because Podcast: The Ride is about to leave you soaked: soaked with laughs and lightly researched audio entertainment! Anthony Gioe joins us to talk about Disneyland classic Splash Mountain. Join all your friends: Mike, Scott, Jason, Reese, Kisses, Twizzler and special guest Evan Susser (Fist Fight, Doughboys) for a delicious discussion about Hersheypark. In the 80s, Disneyland had a teen dance club called Videopolis. Join the gang as they fantasize about going there, dancing to Bananarama and being young again. With special guest Doug Jones! Your hosts travel to the Institute of Future Technology to discuss one of Universal's classic attractions. Listen quick, or Mike, Jason and Scott will fade out of that picture you have of them! Fasten your seat belts as we head to the most magical parking garage on Earth. Are the parking spaces good? Are the escalators bad? Listen and find out! W/ special guest Nick Wiger (Doughboys, @Midnight). The boys discuss the Disney World attractions ExtraTERRORestrial Alien Encounter and Stitch's Great Escape. A discussion that tests the limits of friendship when Mike makes a shocking confession. A jaunt to the Keystone State takes a turn into Garfield's Nightmare as we discuss Kennywood with Jon Daly (Kroll Show, A Futile And Stupid Gesture). Don’t hide like Dr. Hammond’s coward lawyer. Join us and take the plunge on this Universal Studios classic with Matt Mazany (WWE, Gay Of Thrones). Jason, Mike, and Scott whisk you through their favorite Disney Christmas parades and specials from the 70s, 80s, and 90s! Avery Schrieber and Art Carney fans rejoice! On this episode, we tackle the theme park world's most beloved institution. The crown jewel of Universal's Toon Lagoon: Dudley Do-Right's Ripsaw Falls. Put on your Vote Nixon button and grab some boysenberries, we're talking Knott's Berry Farm with guest Ryan Perez (SNL, Lords of Synth). This episode contains an alarmingly sincere discussion of It's A Small World with special guest, Marissa Strickland (UCB, Happy Endings). The boys discuss the recently closed Epcot attraction, The Universe of Energy/Ellen's Energy Adventure. This episode brought to you by your friends in the Fossil Fuel Industry. The Great Movie Ride is discussed on a very normal episode of Podcast: The Ride. Walt Disney World. Disneyland. Which is superior? Today we settle the age old debate. And we forced Mike Mitchell (Netflix's Love, Doughboys Podcast) to help us. Spoiler alert: he was no help.